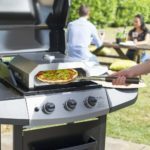 This grill-top pizza oven from UK supplier Oxford Barbecues provides a neat addition to your outdoor barbeque experience, and works well on both gas or charcoal home barbeques. Once ordered, it arrives fully assembled, so you can put it to use right away and start baking delicious homemade pizza, bread and pastry from the comfort of your garden or outdoor patio. Great for people who hate putting things together and following instructions! The La Hacienda Firebox works in tandem with your BBQ – it doesn’t work on a standalone basis. Great for those who regularly hold barbeques and fancy adding a gas pizza oven into the mix – without a separate burner to worry about. Once attached to your barbecue, the Firebox will easily reach temperatures in excess of 400 degrees, usually in 10 minutes or less. Perfect for that crispy, authentic Italian pizza taste. The Firebox gas pizza oven is light, resilient and portable, making it very easy to move around and store away for the winter without taking up to much space in the shed or garage. 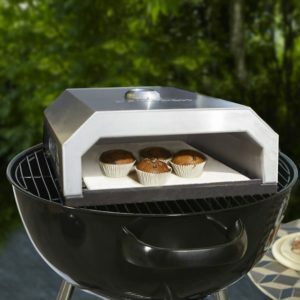 When you want to get cooking, you simply fire up the barbeque and place your new Firebox on top. The downside of this grill pizza oven insert is that you can’t use it without the barbeque, so a lot of energy goes into heating it. Once heated, the La Hacienda Firebox is well insulated with high grade stainless steel to retain as much warmth as possible. Because it has a double skin insulated cavity inside, the heat is distributed evenly to ensure a crisp, evenly cooked finish – something that can be hard to achieve with a wood burning pizza oven if it is not closely monitored. While it doesn’t have the same rustic charm as say, a clay wood-burning pizza oven, what it lacks in appearance it makes up for in cost and ease of use. As a budget choice, this durable gas pizza oven would make a super addition to any family barbeque, adding versatility to the range of meals you can cook. As well as giving you delicious pizza with a trademark rustic, home-cooked taste in less than 5 minutes, you can also use the Firebox to bake meat, fish, vegetables and bread – all at a much quicker rate than a standard barbecue. The Firebox measures 15cm x 40cm x 35cm and will fit most 3-4 burner gas barbeques or a >22” charcoal barbeque. We all know how expensive it can be to splash out on an expensive stonebaked takeaway pizza – now you can create your own at home whenever you want, for a fraction of the cost. Have fun hosting pizza party BBQs in the summer and letting guests choose their own toppings. Who says it always has to be burgers and sausages? This little gas pizza oven is the friend of food and outdoor lovers alike.